Iranian director Babak Najafi follows up the 2013 action film Olympus has Fallen with the more obvious title of London has Fallen. This time Washington D. C. is the safe zone but London comes under attack by a Pakistani arms dealer Aamir Bakawi who is wreaking havoc on the West for a drone attack which killed his daughter during her wedding back in Pakistan. Bakawi is helped by his vengeful son Kamran played by Waleed Zuiater (The Visitor). Two years later, after the sudden death of the British prime minister, the entire group of G8 leaders plan on assembling in London for the state funeral at Westminster Abbey. No London landmark is safe as the Houses of Parliament, the Abbey, Chelsea Bridge all come under attack but fear not the American president Benjamin Asher played again by Aaron Eckhart is protected by macho bodyguard Mike Banning wonderfully played to form by Gerard Butler, both of whom were in the first film. This time Banning has more to fight for including getting back to his expectant wife Leah played by Radha Mitchell. As the situation deteriorates in London, and the security forces cannot be trusted as many of whom are employed by the elusive arms dealer, Bakawi who is gleefully watching the destruction of the British capital from a café in Yemen. 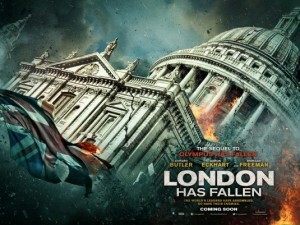 Whilst director Najafi does not concentrate on a complex political backstory, his main focus is on delivering a fast paced action thriller filled with brilliant stunts, classic one liners mainly uttered by Gerard Butler, London has Fallen, despite the unlikely plot, is sure to satisfy action fans. With a great supporting cast including Oscar winner Morgan Freeman (Million Dollar Baby) as the vice-president Trumbull who is directing the presidential extraction from the Washington situation room along with Robert Forster and Jackie Earle Haley, London has Fallen is similar to Olympus has Fallen but lacks originality although is sure to raise more security questions considering how the enemy is portrayed as infiltrated British police officers. In light of the Paris attacks in November 2015, London has Fallen is gripping but the explosive action does little to actually make the narrative seem more credible. Like the first film, audiences should expect a high body count, a couple of twists and turns and Gerard Butler saving the day. As the mysterious mole in British intelligence says, the barbarians are at the gates, London has Fallen raises more questions about which city would be under attack next, especially considering the current state of geo-political affairs and more significantly the rapidly growing migrant influx into Western Europe. 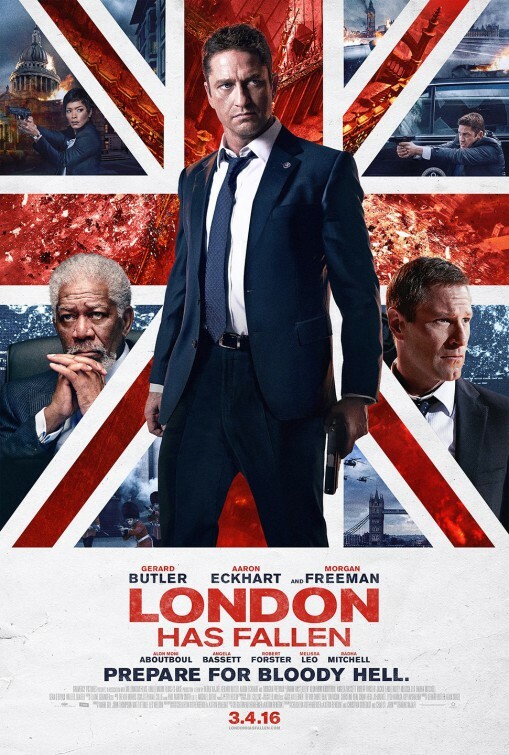 London has Fallen is a real action film, short on plot but big on visuals and explosions. Fans of Olympus has Fallen will enjoy this interesting sequel. A third film is sure to follow to make up an explosive trilogy.